The Minerva's Den DLC for the PC version of BioShock 2 finally has a release date. Does anybody even care about this anymore? 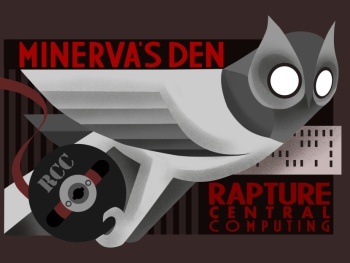 It's been more than eight months since Minerva's Den debuted on the Xbox 360 and well over a year since the release of BioShock 2, after all, and while it's not unheard of for expansions to come out that long and longer after a game hits the market, there's been virtually nothing to hold the attention of PC gamers aside from the very thin and comically bungled Protector Trials pack that finally fell off the truck last month. But after canceling the PC release of Minerva's Den back in October and then bringing it back to life in response to fan outrage, the "new" DLC is finally ready to rock. The update will arrive on May 31, bringing with it a bunch of new achievements and a suitable conclusion to the BioShock 2 story. To mark the event, Minerva's Den Lead Designer Steve Gaynor wrote up a behind-the-scenes blog post about the history of the DLC; part one is up now on the 2K Blog, while part two will be posted on launch day. Cheap shots at the ridiculously-delayed launch come easy but to be fair, Minerva's Den was a very well-received add-on. Joystiq called it "a very interesting and value-packed single-player expansion" while Kotaku said it was "a fine way to put BioShock 2 to bed." Long wait notwithstanding, 2K deserves credit as well for reversing course and bringing the new content to the PC in response to gamer outcry, so good job on that one, guys. Minerva's Den will be available through Games for Windows Live, at a cost of 800 Microsoft points.